The 2012 Honda Civic Natural Gas received the 2012 Green Car of the Year award! This great vehicle is Diamond Access Lane friendly. 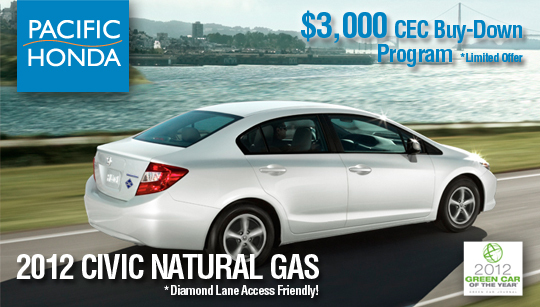 The California Energy Commission (CEC) has a limited program going on now where you receive $3,000 as part of a Buy-Down Program toward your purchase of a New Civic Natural Gas! This is a limited offer, so hurry in to Pacific Honda today! More information from the CEC can be found HERE. 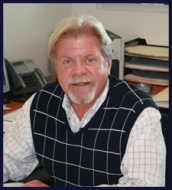 Our Fleet Director, Brad Johnson sold the first Natural Gas vehicle in the United States in June of 1998. He has 13 years of experience, ad does our certified mechanics. Pacific Honda has been the top dealer in NGV sales since 1998. We also have the highest availability for vehicles in San Diego County. Contact Brad to reserve your new NGV today!